Republicans largely expect their immigration bills to fail on Thursday afternoon. House conservatives are already shifting blame to Democrats, despite controlling a majority. 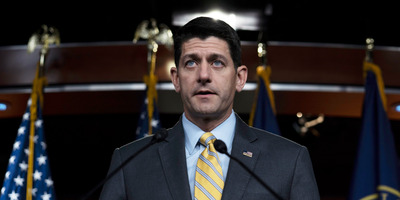 WASHINGTON – Despite holding a solid majority in the House, Republicans are already gearing up to place blame on Democrats for what will likely be the failures of multiple immigration bills making their way to the House floor on Thursday. The House is voting on two different bills. One is a hardline conservative bill that has been under consideration for months. The other is a “compromise” bill cobbled together in the final minutes of an attempt by moderates to commandeer the floor from Republican leaders. Neither bill is expected to pass, given fierce divisions in the GOP conference. And the Republican leadership’s primary goal was to avert the discharge petition and never had interest in passing a bill, according to a high-ranking Republican aide. Nevertheless, Republicans are already shifting blame to Democrats, who have been sidelined while the two immigration bills were being crafted. Rep. Andy Harris of Maryland told Business Insider that because Democrats support a fix for the Deferred Action for Childhood Arrivals (DACA) program, which both bills include, the blame lies on them for not voting for it. When asked why Republicans cannot unite around a bill, despite having an overwhelming majority of seats in Congress, Harris again blamed Democrats, many of whom object to other components of both bills on border security policy. Even House Speaker Paul Ryan tried to pin the situation on Democrats during his weekly press conference Thursday morning. Ryan also downplayed the importance of even passing a bill, acknowledging that it was merely a concerted effort to avoid the discharge petition. But Rep. Jim Jordan of Ohio, a founding member of the ultra-conservative House Freedom Caucus, said a heavy portion of the blame belongs to many in the House Republican Conference. Throughout the immigration process in Congress, the sole litmus test for any legislation was whether or not President Donald Trump would sign a bill into law. Because Republicans have a majority in the House, its passage through the lower chamber should be a piece of cake. But with a fractured GOP conference, Republicans will try to pin it on the Democrats. Update Thursday afternoon: Republicans failed to pass the conservative Goodlatte-McCaul immigration bill by a vote of 193-231. While 41 Republicans voted against the bill, the ‘yea’ turnout exceeded original expectations. In addition, House Majority Leader Kevin McCarthy postponed the vote on the moderate compromise bill until Friday so that members will have more time to read and consider it. The entire House Republican Conference will me at 4:30 pm ET to discuss the next steps.